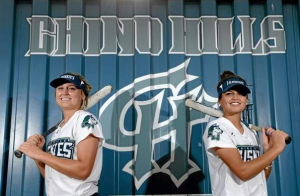 Tannon Snow, a University of Washington commit, went 5 for 5 with three home runs for the Chino Hills Huskies in the victory over St. Lucy’s, 22-7, on senior night. Snow’s second home run broke the CIF Southern Section single-season home run record, according to Huskies head coach Mike Southworth. Snow’s third home run increased her record and total on the season to 23 home runs. The win also provided the Huskies sole possession of the Baseline League Championship for 2015. “It was a pretty amazing day,” Southworth said. Tannon’s sister, Taylon Snow contributed to the Huskies with a 3 for 6 performance as she scored two runs and brought in three. Kylie Michael went 3 for 4 for a three-run home run against the Regents. Chino Hills will wrap up the season next week with games against Etiwanda and Los Osos. “These next two games will be a big deal for us as we prepare for CIF,” Southworth said. The CIF-Southern Section announced the results of 14 releaguing appeals on Friday, and the only one from a San Bernardino County or Inland Valley school was Ayala, which had its appeal denied. Ayala is scheduled to move into the Baseline League along with Chino Hills, in the fall of 2014, replacing Alta Loma and Glendora. Of the 14 appeals, only two were accepted: those of Simi Valley and Simi Valley Royal. Ayala’s was one of the 12 denied. Ayala was denied by a vote of 13-1.